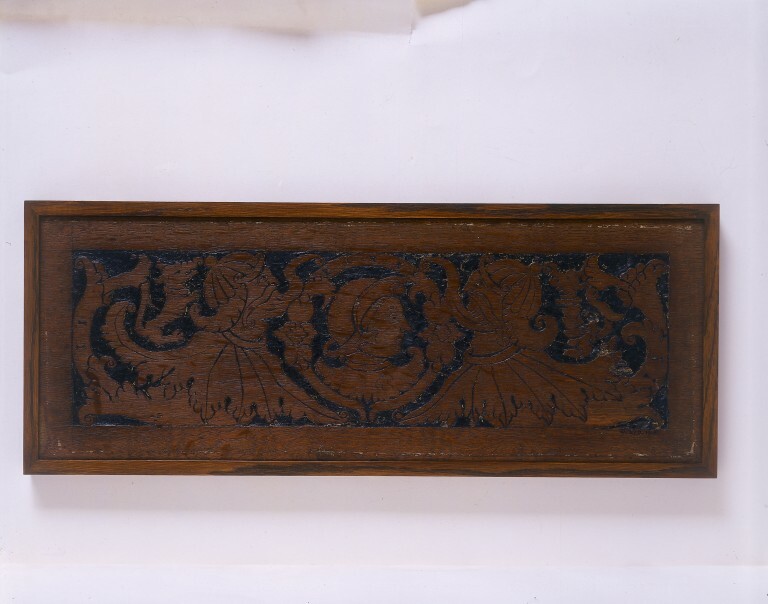 The panel is part of series, decorated with classical motifs, thought to have come from a room at Painswick Park, Gloucestershire. One of the panels includes the arms of Sir William and Lady Kingston. Sir William Kingston (died 1540) was a Knight of the Garter and the Comptroller of the Royal Household. In 1524 he was appointed Constable of the Tower of London. He received Anne Boleyn, second wife of Henry VIII, into custody at the Tower in 1536, just before her execution. By the 1530s, classical ornaments were widely used in decoration. They were derived from Italian ornament and would have been described then as 'Romayne' or 'Antique'. 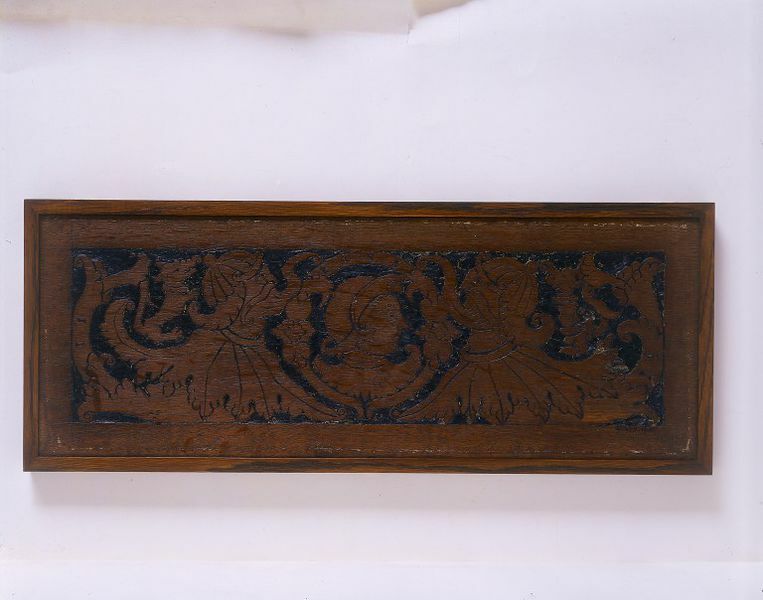 The background of this oak panel has gouged out and filled with chalk and verdigris (a greenish blue substance that forms on copper and brass). This practice was well known in north-east Italy from about 1400, but a novelty in England. A group of ten panels with incised ornament and sunk background filled with black composition; the designs consist of heroic heads, scrolls and conventional ornament, with the initials R.P., and the sacred monogram. Two of the panels have the arms of Sir William Kingston surrounded by the Garter, another those of Lady Kingston. The ten similar panels (W.52-1913, W.53-1913, and W.37 to f-1918) were bought by the donor in Bristol, and it is suggested that they may have come from Painswick Park, Gloucestershire, which was one of the residences of Sir William Kingston (created KG 1539, died 1540), or Haxley Abbey. 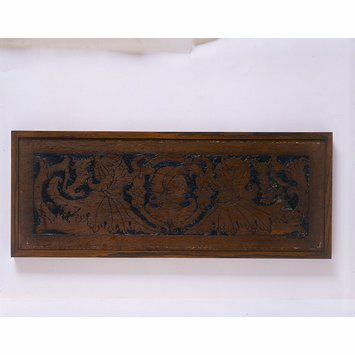 incised ornament, black compo; English, 1500-50, 8 1/2" x 1/ to 2/ 2"
Another form of decorating panels of furniture at this time was by cutting out the ground, leaving the rest of the surface for the design; the sunk ground was then ﬁlled in with hard coloured composition. The panels (ﬁg. 43) are either from the top of a long armoire or from the overdoors and overmantel of a room. They were made for Sir William Kingston, Constable of the Tower, who was the gaoler of both Anne Boleyn and Weston. He was created Knight of the Garter April 24, 1539, and died in 1540, so their date is conclusively ﬁxed by the panel, unfortunately mutilated, bearing his arms, within a garter, Quarterly, 1st and 4th azure, a cross between four leopards’ faces argent; 2nd and 3rd ermines, a chevron and in chief a leopard’s face. The other arms are those of Lady Kingston, and the remaining panels of this series are decorated with heroic heads and scrolls of conventional ornament. It was solely through the report made by this Sir William Kingston to Cromwell of what Anne Boleyn had during her captivity told Lady Kingston in conﬁdence, that young Sir Francis Weston ﬁrst became implicated.